Data quality derives from the combination of accurate instruments plus Data Encoding Standards: one can take highly accurate data samples but if there is no agreement as to what the data means, the data could be considered to be of low quality because of its inability to improve the decision making process. The global demand for energy production, coupled with concern over the impact the current production methods have on the environment, is driving national and international programs to enact tough environmental requirements and encourage the rapid development of clean energy resources. The newly invigorated renewable energy market offers many opportunities for today’s foremost governmental and private sector solution providers, with solar energy contributing to both the future global electricity supply and lessening the negative effects of climate change. As one of the cleanest energy sources that can be harvested sustainably, there is growing consensus that the solar energy sector is entering a significant growth cycle during the next 20 years. This past year alone the United States, Germany, Italy and the U.K. have all installed a record number of solar panels. China, for the second year in a row is preparing to double its solar capacity. Countries with the highest energy demands have much to gain from solar production as evidenced this past spring when Germany set a new world record by feeding 22 gigawatts of solar power per hour into the national grid and meeting nearly half of the country’s power demand during a single weekend. Equally important to recognize is that solar power is quickly becoming a primary viable solution for the 1.3 billion people around the world with no direct access to grid energy. PV technology is rapidly diversifying as manufacturers and suppliers position to capture the 100 GW of PV energy forecasted by 2020. After years of dormancy, policy shifts towards solar production are serving to catalyze renewed research and development, making solar energy generation more effective now than ever before. Solar panel efficiency is making huge advances; according to a recent MIT Technology Review, while conventional silicon solar panels typically convert less than 15% of light, a start-up company in North Carolina called Semprius has just tested its solar panels and scored a 33.9% efficiency rating! For the first time a solar module has been able to convert more than one-third of the sunlight that falls on it into electricity. From an investment point of view, there has been an international growth rate in the solar market from 2007 to 2011 of approximately 70% per year - from 2009 to 2010 alone it was a whopping 172%! This year the market has experienced a slowdown due to the reduction of government incentives, but the long-term growth estimates still range from 20% to 30% per year. While government subsidies are winding down, big private investors are picking up. For example, MidAmerican Energy Holdings recently purchased a solar farm in Southern California for $2 billion. In 2011, Google reported it invested over $450 million in solar projects and GE has announced that it is going to build the largest solar plant in America, capable of powering 80,000 homes each year. In the next few years, billions of dollars are expected to come into the solar market. For all of these reasons solar generation looks to be a promising energy sector for the future. However, prior to fully embracing solar production utility companies, independent power producers and developers are confronting several critical concerns regarding the reliability and economy of this technology that will shape the stability of widespread solar deployment. Commercial plants operate under performance-based contracts. Before prudent investors will commit, they want to know what energy production results can be expected from a given PV array or plant. Understanding PV module and array performance is fundamental to predicting and thus maximizing actual electrical production and for scheduling ongoing maintenance. The standard method for testing module and array performance in the past has been to utilize a single reporting condition set at an artificial uniform ambient temperature of 25°C. This standard reporting condition does not reflect actual on-site operating conditions where 50°C (or -10°C) can be more common. More importantly an artificial environment does not accurately address variable weather factors involved in actual outdoor performance. Being able to provide quality ‘bankable’ statistics from a given site is fast becoming a primary concern. The bankable data investors seek is based on the ratio between the output power of the equipment and the available sun at the specific location. To determine this ratio (and ultimately the efficiency of a site), performance data must be initially gathered on-site to create a base of output expectation and then continually assessed to track whether the plant is meeting the anticipated production goals. Simply monitoring the level of energy production of PV modules or arrays only provides information about the problem, not the solution. Using continuously active on-site meteorological data gathering equipment, monitoring can expose certain problematic conditions that reduce optimum solar gain, including shadowing from structures around plant, misaligned or moved panels, and dirt on the panels. Gauging the surface temperature of a given panel is also helpful to monitor because if the actual panel gets too hot the efficiency will go down. Meteorological monitoring equipment and systems have sprung up in both the residential and industrial PV sectors to fill this need for on-site monitoring. There is, however, a range in the accuracy of the data acquired as well as disparity in the ease of installation of these various products. 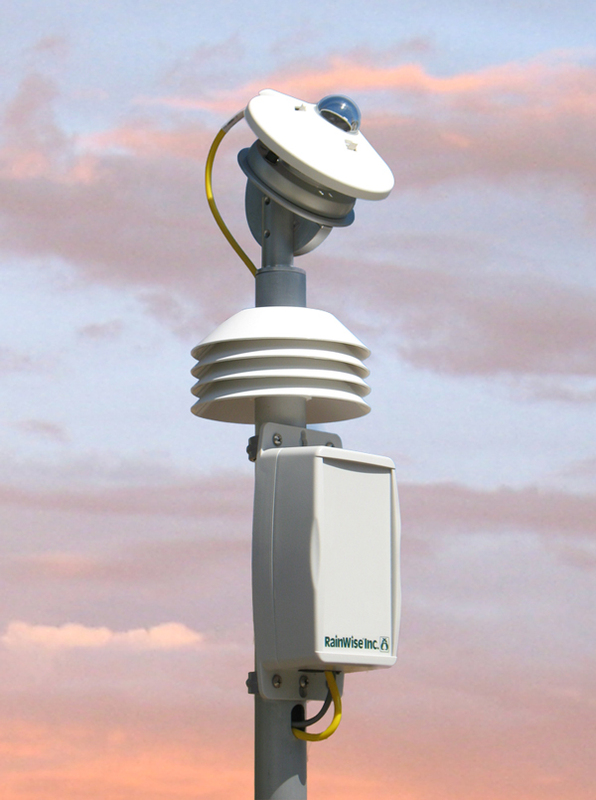 Some of the available solutions provide complicated weather stations while others involve individual sensors that need to be wired individually. Often these solutions utilize low-grade sensors that provide low-accuracy data. In response to the need for a compact easy to install weather station specifically designed for solar plants that require the highest standard in dependable data, Maine based RainWise Inc. developed the PVmet weather station series. Consolidating all the necessary sensors into a convenient package, the weather stations in the PVmet series offer sensors aimed at dirt, misalignment and shadowing concerns, global and/or plane–of-array sensors for irradiance solar monitoring, back-of-module sensors to track the panel temperature, and wind speed/direction sensors to track cooling effects. Wind speed can also give indications of incoming storms, information that help tracking panels to go into ‘stow’ formation for protection – an important safety measure in hurricane and tornado prone areas. Since it’s release in 2011, the PVmet series has undergone design evolution in direct response to industry demands. The first generation introductory level PVmet began with a single silicone pyronometer global solar irradiance sensor, a back-of-module sensor for panel temperature and an ambient air temperature sensor. In response to customer requests RainWise upgraded the single irradiance sensor unit to have an adjustable bracket so that it could be either global or plane-of-array. A second plane–of-array sensor was added to PVmet intermediate station in addition to the global sensor as well as the addition of a wind measurement sensor. Sites being funded by investors require a high level of accuracy and accountability in the data acquired by the sensors and solar sensors in particular are not traditionally highly accurate. In response to this concern RainWise upgraded the irradiance sensor to a highly accurate thermopile sensor line and is now able to offer a spectrum of these higher accuracy sensors depending on the needs of the industry. The wind sensor has also been upgraded to an ultrasonic sensor with no moving parts, thus reducing maintenance & repair and increasing longevity. The PVmet commercial and utility-scale PV energy efficiency monitoring weather stations are successful in providing the optimal environmental data necessary for maximizing actual on-site performance modeling. Providers and investors now have the necessary instruments for acquiring bankable information with which to move forward in the development of dependable mid and large-scale solar power plants. A second important concern that can limit the potential deployment of a widely adopted solar industry is the state of interoperability between the various plant elements. A single solar plant may incorporate components from multiple vendors and manufacturers. Inverters, string combiners, data loggers and meters may not all use the same protocol or data-encoding format, which in turn prevents inter-communication. Getting each of these elements to cleanly communicate with all the other elements - to ‘interoperate’ - can be technically difficult and time consuming. There is a widely used and accepted method of data formatting protocol in the industry called Modbus and many components used in commercial PV systems support it. Modbus is based on the principle of a single master working with several slaves. By definition, a Modbus master can communicate with any Modbus slave, the catch being that the master must be individually configured in each case to read the site-specific slave. The actual configuration will vary depending on the proprietary data structure of the individual slave device. It is the need to program each master to the respective slaves that leads to time and money challenges with any given system. The SunSpec Alliance was formed in 2009 to address this issue by defining a set of communication encoding standards relating to the Modbus data structure that, when used by each element, ensures that the master is able to identify, read and control the slave automatically. When manufacturers agree to utilize this standard protocol, the need to manually configure the master to read each individual device is eliminated. Another advantage that a single communication protocol provides is that equipment can be swapped in the field without the need for reprogramming; the new equipment does not have to be from the same manufacturer – it only needs to be SunSpec Alliance Certified™ to be compliant. After reviewing the positive financial ramifications of plug and play interoperability between various PV plant elements, one is hard pressed not to recognize the implicate value of utilizing these standards in communication; RainWise is proud to acknowledge that in 2011 the PVmet Solar Energy Efficiency Monitor was the first weather station on the market to be awarded certification as SunSpec Alliance Certified. There is little doubt that solar power generation holds a valuable place in the future of sustainable global energy production. Policy makers and energy providers are driving the need for quality bankable data in order to make better decisions. Data quality derives from the combination of accurate instruments plus Data Encoding Standards: one can take highly accurate data samples but if there is no agreement as to what the data means, the data could be considered to be of low quality because of its inability to improve the decision making process. A product that meet both requirements such as the SunSpec Alliance compliant RainWise PVmet monitoring solution is garnering the respect and support of investors, providers, and end-users alike, and setting a solid foundation for reliable, economical and widespread solar deployment.